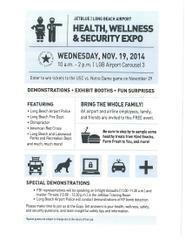 JetBlue HealthAndSafety Expo tomorrow Long Beach Airport from 10am to 2pm at LGB Carousel 3. Demonstrations, Exhibit Booths, & Fun. Please join the Long Beach Fire Department and join us at the JetBlue/Long Beach Airport Health, Wellness and Security Expo. The event is tomorrow, Wednesday, November 19th, 2014 from 10 AM through 2 PM at Long Beach Airport Carousel 3. There will be demonstrations, exhibit booths, and fun surprises. Bring the whole family. The event is free. FBI representatives will be speaking on Inflight assaults from 11-11:30 AM and Insider Threats from 12-12:30 PM in the JetBlue Training Room. Long Beach Airport Police will conduct demonstrations of K9 Bomb Detection. Please make time to join us at the Expo. Get answers to your health, wellness, safety, and security questions. Learn insightful safety tips and information.